The world is hugged by the faithful arms of volunteers. Volunteers are the heart and soul of the New Paltz Turkey Trot! We are looking for volunteers to help out with early packet pickup Wednesday November 21st, 2018 at the Jewish Community Center, 30N. Chestnut Street, New Paltz, from 12pm – 6pm, and on Thanksgiving morning at the event from 7:30am-11am. Tasks Thanksgiving morning include setup, registration, packet pickup, finish line assistance, and cleanup. 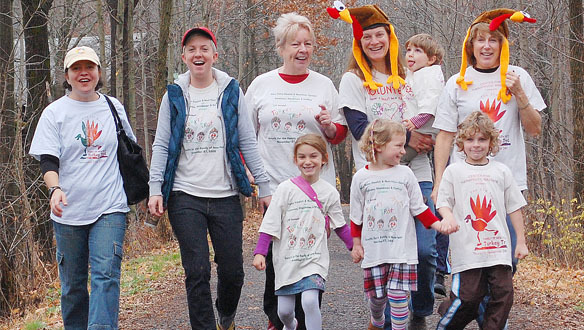 All volunteers will receive a Turkey Trot t-shirt and refreshments. To sign up as a volunteer please email volunteers@familyofwoodstockinc.org or call 255-7957. Error: Error validating access token: Session has expired on Monday, 19-Nov-18 17:38:50 PST. The current time is Friday, 19-Apr-19 07:14:33 PDT.